Fred Sandback: Sculpture and Related Works presents the yarn sculpture and works on paper by one of America's important and influential artists, Fred Sandback. The exhibition premiered at the Sioux City Art Center, was curated by Christopher Cook, and is expanded to include additional works for the University of Wyoming Art Museum. Working within the architectural structures of the museum gallery, Sandback created intriguing sculptures from the most modest and commonplace material--store-bought yarn. Using individual lengths of yarn that are stretched tight, often from floor to ceiling or floor to wall, Sandback creates the illusion of three-dimensional forms. Rectangular planes, squares, triangles, and trapezoids are described in space but without the use of surfaces and without occupying space. The resulting illusion of solid forms--often suggesting panes of glass leaning against a wall or placed without any supporting structure--amaze viewers who experience the work. Through the elimination of mass and surface, Sandback's' work challenges the traditional notion of sculpture as an opaque form made from solid materials such as stone, wood, or metal. Born in Bronxville, New York, in 1943, Sandback received a BA in philosophy from Yale University and an MFA from Yale's School of Art and Architecture where he studied sculpture. Since his first two solo exhibitions in 1968, Sandback's work has been exhibited widely in the United States and abroad, including one-person exhibitions at The Museum of Modern Art, New York (1978); Dia Center for the Arts, New York (1996); and the Chinati Foundation, Marfa (2001); and group shows at the Whitney Museum of American Art, New York (1968); Art Institute of Chicago, Chicago (1979); and the Metropolitan Museum of Art, New York (2005). 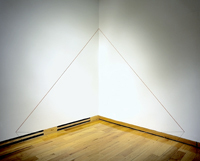 In 1981, the Dia Art Foundation supported and maintained a museum of his work, the Fred Sandback Museum in Winchendon, Massachusetts, which featured a selection of his work on permanent display until the artist decided to close the museum in 1996. Sandback died in 2003. David Raskin is an Associate Professor in the Department of Art History, Theory and Criticism School of the Art Institute of Chicago. Funded in part by the Andy Warhol Foundation for the Visual Arts, Murdock and Associates Law Firm, the National Advisory Board of the UW Art Museum, the National Endowment for the Arts, and Wyoming Pubic Radio.